March 11, 2018 — Birthplace of the skyscraper, Chicago played an important role in the development of architectural Modernism. This great legacy includes the contributions of many Jewish architects, some now famous and others who have long been overlooked. In this illustrated talk, historian, author, and preservation planning consultant Julia Bachrach will highlight the work of Chicago Jewish architects from the 1890s through the 1970s. A social hour with kosher pastries will follow the program. 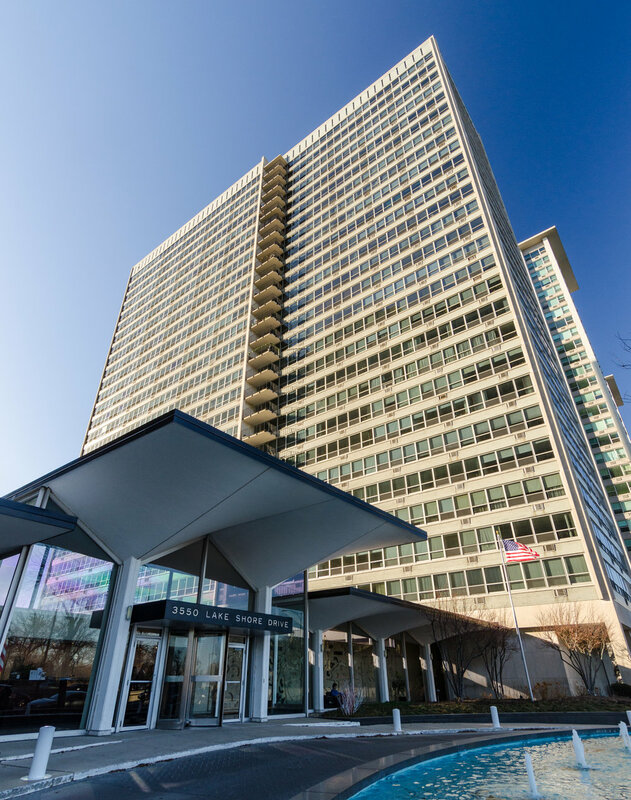 Please visit Julia's blog to read her essay the legacy of Jewish architects in Chicago. February 20, 2018 — The Mies van der Rohe Society, IIT College of Architecture, and docomomo US/Chicago invite you to engage in a conversation about the preservation and heritage of Mies-designed buildings in Chicago and throughout the world. A round table discussion will follow with distinguished panelists including Mark Sexton, FAIA; Gunny Harboe, FAIA; Dirk Lohan, FAIA; and moderator Michelangelo Sabatino, dean of IIT College of Architecture. 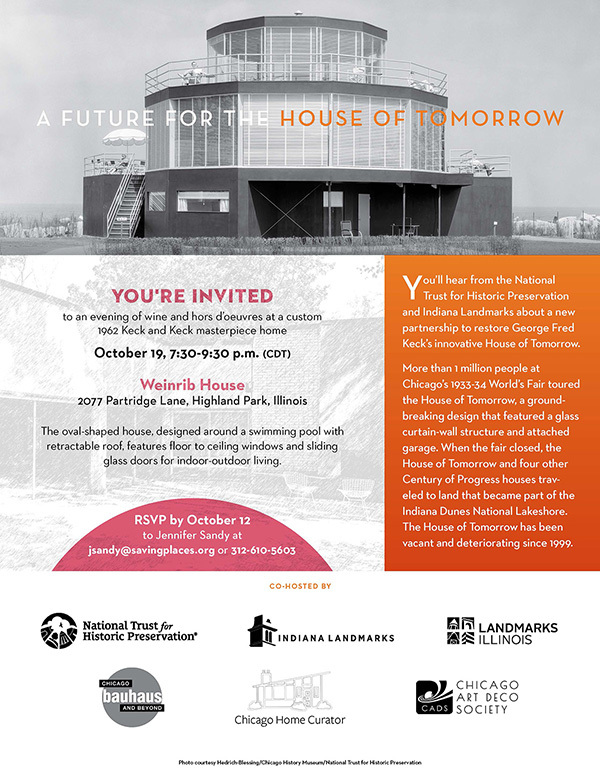 October 19, 2016 — The National Trust for Historic Preservation and Indiana Landmarks will announce a new partnership to restore George Fred Keck’s innovative House of Tomorrow. 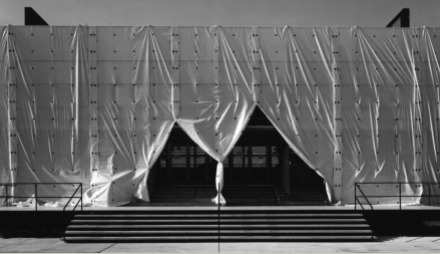 More than 1 million people at Chicago’s 1933-34 World’s Fair toured the House of Tomorrow, a groundbreaking design that featured a glass curtain-wall structure and attached garage. When the fair closed, the House of Tomorrow and four other Century of Progress houses traveled to land that became part of the Indiana Dunes National lakeshore. The House of Tomorrow has been vacant and deteriorating since 1999. May 16, 2016 — Over the past two decades, the Cuban government has focused increased attention on the conservation and restoration of the island's historic architecture. Early restoration initiatives focused primarily on buildings of the Colonial period, but Cuban architects and preservation activists are now becoming increasingly vocal about the need to conserve buildings from the more recent past. 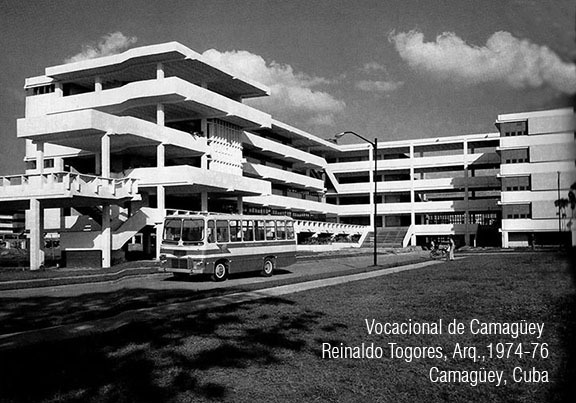 Architect Wilfredo Rodriguez Ramos will address the state of conservation of modernist architecture in Cuba today and give some insight into the potential impact of normalization of diplomatic relations between Cuba and the United States on these efforts. Wilfredo Rodriguez Ramos is an architect and project director at EPIA ONCE in Camagüey, Cuba. He is the president and founder of DOCOMOMO Camagüey, Cuba and the executive secretary and founder of the Art Deco Society of Camagüey. He is a member of the Provincial Commission of Monuments and Chairman of the Advisory Council for the Development of Monumental and Environmental Sculpture in Camagüey.